Find fun activity ideas for your Jewish residents for the upcoming Jewish holidays, including Passover and Shavuot. 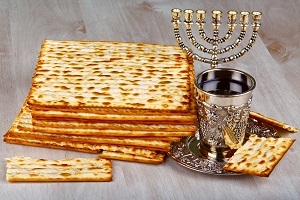 Passover (also called Pesach) is the Feast of Unleavened Bread that is an eight-day celebration. Most people have seen The Ten Commandments which is more or less the story of Passover (albeit with a Hollywood flair). Basically, Passover celebrates the Jewish people's exodus from slavery in Egypt and their journey to the Promised Land in what is now Israel. This year, Passover begins at sundown on Friday, April 19 and lasts until sundown on Saturday, April 27. The Passover holiday begins with a festive meal, the Seder, on the first two nights of the holiday. During the meal, the story of the exodus, called the haggadah, is recited. Because a Seder can make for a multi-hour evening, it is not always the most practical activity for a community. However, we hold a model Seder as a lunch program for those who want to participate a few days into the holiday (see The Model Seder section for details). Also during the holiday, we do not eat any leavened products, like bread or pasta. Instead we eat an unleavened bread called matzah to commemorate how fleeing Jews did not have the time to wait for bread to rise while trying to escape Egypt. For a very brief and easy to understand version of the story, as well as some easy recipes and craft ideas, check out an online resource that we use. As stated above, the Passover holiday begins with a Seder – a festive meal which follows a set order of prayers and rituals. It is the re-telling of the story of Moses and the Jews' exodus from slavery in Egypt to the Promised Land. Growing up, the Passover Seder is one of my fondest memories. In my family, it meant traveling to the homes of relatives or friends (if we weren't hosting), and the more, the merrier! Because the Seder can be a long process, we do a shorter model Seder. You can choose to do it as a lunch or a dinner, and invite family members to participate as well. We do it as a lunch. So...what will you need to make your model Seder a success? First, is the Haggadah itself, the text that provides the order of the Seder. Here is a free resource that you can use for your Seder. Next is the Seder plate. There are a number of symbols that occur through the Seder, but at the center of the whole event is the Seder plate. It contains a roasted shank bone, symbolizing the Passover sacrifice in the Temple; a roasted egg, which symbolizes either the spring season or mourning (for the destruction of Jerusalem); maror (bitter herbs), to represent the bitter experience of the slaves; haroset (a mixture of apples, nuts, raisins, spices, wine), symbolizing the mortar the slaves used to build for the Egyptians; and karpas (parsley, celery, or another green vegetable), symbolizing the green of spring. The table must also have three pieces of matzah, with each piece used for a different purpose, usually held in a special pouch made to be used during the Seder. Shavuot is the Feast of Weeks that recognizes the Torah's reveal to the Jewish people on Mt. Sinai. It also represents the wheat harvest in the Land of Israel. Traditionally, observers make meals that contain dairy – with cheesecake and cheese blintzes being holiday favorites. In addition, it is customary to decorate one's home with flowers for the holiday. 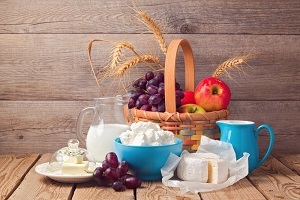 This year, Shavuot begins at sundown on Saturday, June 8 and lasts until sundown on Monday, June 10. Host a cheesecake tasting, featuring a variety of cheesecakes for residents to sample. Decorate vases that can be filled with flowers for the holiday. Use real flowers to make flower arrangements for each of the Dining Room tables in your facility. Want more of these activities in your senior activity calendar?